While perusing my local big blue box store’s chocolate aisle, I noticed several bars of chocolate in intriguing-sounding flavors, like this one: a bar called “Firecracker.” Candy Addict is no stranger to Chuao Chocolatiers, the gourmet chocolate company that uses Venezuelan cacao and exciting flavor combinations that impress and delight fans of chocolate. Speaking of exciting, if you have one of those big blue boxes (aka Wal-mart), you now have easy access to some fancy chocolate! Read on to see just how exciting this chocolate is. With a name like “Firecracker,” you would assume the marketing team just chose a word that sounded exciting to make you think their chocolate bar was also exciting. 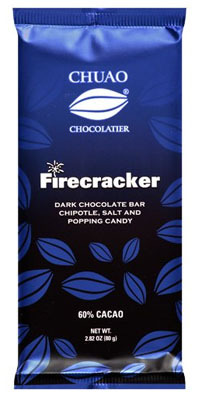 Turns out, Firecracker is the perfect way to describe this chocolate! No, there aren’t literal fireworks, but the closest thing you can get and still ingest it: popping candy. The bar also boasts dark chocolate, chipotle, and salt. So imagine if you will: a smooth bar of dark chocolate. You bite into it and taste an above average chocolate flavor, and then you’re hit with the warming sensation of chipotle pepper (it’s not overwhelmingly spicy in this bar, but rather subtle). Your tongue next detects that this candy is slightly salty, and then *POP* goes the popping candy. The popping distracts you for several seconds, and then you remember there are other things for you to taste here. You will yourself to ignore the popping and focus on the salty chocolate flavor. Verdict: This candy bar is definitely worth a try. It’s tasty, and highly entertaining. Definitely a good one to share with friends. Pros: Lots going on, something for everyone, good amount of spiciness and salt, the entertainment of popping candy in your chocolate. Non-GMO ingredients. Cons: These cost a bit less than $4, so they are high on the spendy scale. Depending on your personality type, there might be too much going on in one bar of chocolate. This chocolate bar is amazing!!! I loved it ’till the last piece. The chipotle comes in very strong but soon the decadent flavor of the chocolate comes in and mixes it up in a delicious way!! !